Tag Archives for " NutriChef "
NutriChef has been able to come up with one of the best food dehydrators that you can buy for your home and the same has been doing well in the market. The NutriChef PKFD06 Electric Food Dehydrator is both effective and efficient in serving as the perfect food dehydrator for the long term use. One of the best options that you have in the market, this food dehydrator helps in removing the moisture from several varieties of food and also helps in storing the dehydrated food. 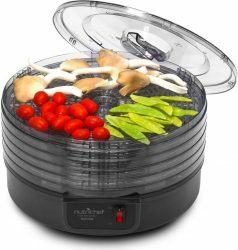 NutriChef Kitchen Electric Countertop Food Dehydrator is an affordable and efficient dehydrator available in the market. The manufacturer of this dehydrator claims, that the food being dehydrated retains up to 97% of its nutritional value and is scientifically proven to lower the chances of food spoilage. This is a unique feature. The single press button for all functions makes it easy to operate. Hence, this is a model highly recommended for new users.